TAMPA, Fla. — Steven Stamkos scored his 36th goal of the season and the Tampa Bay Lightning clinched the Presidents’ Trophy with a 4-1 victory over the Arizona Coyotes on Monday night. Clayton Keller scored for Arizona, which remains one point ahead of Minnesota for the final wild-card spot in the Western Conference. Darcy Kuemper finished with 20 saves. 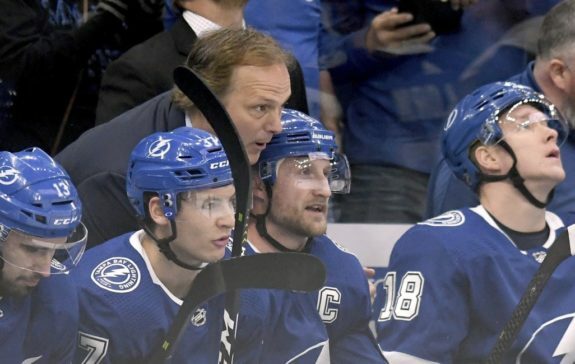 The goal came in the 737th game for Stamkos and broke the tie with former captain Vinny Lecavalier, who set the record in 1,037 games with Tampa Bay from 1998-2013. “Steven is the best goal-scorer in Lightning history and now he has the record to prove it,” Lecavalier said in a statement. Arizona opened the scoring when Richard Panik knocked down a cross-ice pass attempt by Jan Rutta and fed Christian Dvorak who dropped a pass for Keller, who one-timed a shot past Vasilevskiy 5:03 into the game. Stamkos tied the game 1:51 later. After a scoreless second period, Hedman put Tampa Bay in front with a backhand pass across the crease down low from Cirelli 44 seconds into the third period. Cirelli added his fifth short-handed goal of the season with 44.8 seconds left while Gourde added an empty-net goal with 8.6 seconds left. NOTES: Lightning D Dan Girardi (lower body) and D Anton Stralman (lower body) each missed their fifth consecutive game. … Tampa Bay recalled D Cameron Gaunce from Syracuse of the American Hockey League earlier in the day. … Arizona RW Clayton Keller has four goals in four career games against Tampa Bay. … Vasilevskiy leads the league with 20 victories since Jan. 1, Kuemper is second with 19.